There are two bookstores between the office where I work and most of the places where I eat lunch. This means that usually once a week I stop in at one or both places and browse the shelves. This is a bad habit of mine because of have a pile (which is not an exaggeration) of books that I want to read but haven’t gotten to yet, so buying more books is really not something I should be doing. Still, it’s a daily temptation to stop in and see what’s new and twice in recent weeks I’ve been pleasantly surprised. My latest surprise was finding a Burn Notice novel called The Giveaway. Partially because it was in the Science-Fiction/Fantasy section (I’m guessing someone changed their mind and left it there). The show is one of my favorites, but my initial reaction was, “Bleh, a novel?” Out of morbid curiosity, I opened it up and read the first page to see what it was like. It starts out with, “When you’re a spy…” and then goes into one of the show’s trademark voice-overs by Weston. So now I was curious and decided to buy it and give it a read. It was a quick read, took me a day or so, but I enjoyed it quite a bit. Enough, actually, that I ordered the other two books The Fix and The End. The plot is a typical one for the show. Friend Barry, the money launderer, needs a favor. He has a friend, who’s a retired bank robber, that did one last job but ended up ripping of a motorcycle gang and now needs help cleaning up the mess. The dialog, monologues, and action are all very true to the show. The book does bring something new to the series though, there are a couple of chapters written from Sam and Fiona’s viewpoints. This is not something that the show does and I’m not sure it would very well if they tried it, but it worked well in the book and made for interesting insights into the characters. Hrmm, Burn Notice fiction? We’ve been on a Burn Notice binge this summer. We started watching when they ran a marathon of episodes in July, then started working through the series via Netflix. It is a stand out show. I’ll have to see if perhaps the used book store has a copy of one of the books. They are quick reads and make good “vacation books” so the chances of finding them second hand are probably pretty good. If you like the show, the books are more of the same good stuff. I generally steer clear of tie-in books because they usually aren’t very good. Lately it seems like there’s been more and more good to decent tie-ins that I’ve been reading. As far as having the actors in my head, the same thing happens to me, but (in most instances) I prefer it that way. 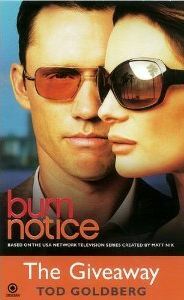 Especially in the Burn Notice books, it’s like having an episode play in my head, which is pretty nice. Thanks for this man. I love Burn Notice, and I will most definitely be getting these books. You’re very welcome, I have a post scheduled this week to talk about the other two books that are out. Where am I? I was gone for vacation for a week and then last week was taking time off from posting while I caught up on work and my RSS feeds. I would say my regular schedule is back in place, but I don’t really have one. 😉 Still, I do have a couple of posts scheduled for this week. I was wondering if the books followed each other like the tv show does. Is Michael trying to figure out his burn notice or is it just a few jobs that the trio is doing? There’s only a peripheral mention of Michael’s Burn Notice and it’s difficult to figure out which (if any) season the stories took place in.